Put your canoe or kayak in at one end of the Allagash Wilderness Waterway and paddle for 92 miles from one pristine lake to another, all connected by a network of rivers and streams. Created in 1966 by the Maine Legislature as a means of conserving this remote landscape, the waterway is also part of the Northern Forest Canoe Trail. A paddler’s dream, this international trail runs from New York to Maine and crosses the border into Quebec, Canada. The Allagash Stream feeds into Allagash Lake at the very western end of the waterway. Averaging a depth of 35 feet, it plunges to 89 feet at its deepest point. Fed by mountain runoff, the water is clear and cold, the perfect habitat for wild brook trout. Adventurous fly-fishermen willing to camp in this remote area will find these fish large and feisty. On the western shore of this lake is a trail leading to an Ice Cave, carved out long ago by glacial activity. Some explorers that have braved the wet, small, steep entrance have found ice in the cave in the middle of summer. The northern shoreline is sandy and rather shallow, attracting moose to feast on the underwater salad bar. After paddling southeast through Little Round Pond and a bit of whitewater at Allagash Falls you end up at Chamberlain Lake. The best wildlife viewing spot is at the northern tip where the Allagash Stream enters the lake, creating a marshy cove. Chamberlain Lake is long and thin, roughly 13 miles long and three miles wide at its widest point. There are roughly 30 primitive campsites along its shores. Camping is free, but a fire permit is required, available through the Maine Forest Service. If you paddle past the old Chamberlain Farm, on the eastern shore of the lake at about the six-mile mark, you’ll find what’s left of a steamship called the George A Dungan, once used to carry pulpwood south to Telos Lake. Harrington Lake is just west of Chamberlain Lake, a man-made waterway used for hydroelectric power. If you paddle to the southern tip of Chamberlain Lake you will reach Round Pond and Telos Lake. The latter waterway was the alleged site of a UFO abduction in 1976. Telos Lake is roughly six miles long and one mile wide and offers six remote campsites with picnic tables, ridgepoles, fire pits and outhouses. Eagle Lake sits on the north-eastern end of Chamberlain Lake, and is the waterway’s second largest lake and reaches a depth of 124-feet. Its irregular shoreline and a number of islands make this one of the most interesting lakes to paddle. Two of the largest islands are Farm and Pillsbury. Pull your canoe ashore on the Pump Handle Peninsula and you will find trails to ledges overlooking most of the lake, including Russell Brook Beach. Roughly 25 primitive campsites are scattered along the shoreline. The Eagle Lake Old-Growth Forest and the Zeigler Old-Growth Forest are also worth a look. A waterway called the Thoroughfare connects Eagle Lake to Churchill Lake. Of special interest is Churchill Ridge on the lake’s northern end. A trail leads to the top of the 400-foot ledge, offering a panoramic view of the lake and the surrounding hardwood forests. In September and October the views are especially stunning when the trees change to their fall colors. Once you leave Churchill Lake, the Allagash River travels 62-miles north until it spills into the St. John River. Along the way it passes through the Chase Rapids, a four-mile stretch of challenging rapids that dump into Umsaskis Lake. Priestly Lake is west of Umsaskis Lake, but it is land-locked, reached by a footpath from Umsaskis Lake. Umsaskis Lake leads to Long Lake, where both Ross Stream and Chemquassabamticook Stream empty their mountain waters. Eventually the river passes through Round Pond and cascades down the Allagash Falls. The trees eventually take on the look of the northern forest, adding spruce, northern white cedar and fir trees to the mix. At the top of the waterway you will find the Allagash Village, where the Allagash flows into the St. John River. If you’d rather not do all that paddling but still want to do a bit of fishing or hunting along the Allagash, the Bradford Camps (Bradfordcamps.com), located on Reed Pond, offers fishing and hunting trips, led by Maine Registered Guides. Many destinations are reached by seaplane and include meals, lodging and boats. Fishing gear is available for rent. Prices range from roughly $420 per person for two night trip to a seven night vacation at $1394 person. Bear, moose and deer hunting trips are offered, as well as custom designed wilderness trips. Baxter State Park and its Mt. Katahdin are two of Maine’s prime tourist destinations. Within the park are a number of lakes and streams that offer the chance to fish and camp out in the wilderness. Daicey Pond offers ten rustic cabins, available winter and summer. Bring your sleeping bag, food and supplies and enjoy hiking and fly-fishing within steps of your cabin. Kidney Pond has a similar set-up. The Nesowadnehunk Campground, about 35 miles northwest of Millinocket via Route 157, offers primitive tent sites, including three sites at Bear Brook. This is the trailhead of the Wassataquoik Lake Trail, leading to Doubletop Mountain and Russell Pond. Trout Brook Farm is one of the most remote campgrounds in the park and is near Matagamon Lake. The campground is 26 miles west of Patten via Route 159. Canoes and kayaks are available for rent at many park campgrounds. Motor boats are allowed on Matagamon Lake, Webster Lake and Nesowadnehunk Lake. Boats with motors of 10HP or less are allowed on Upper and Lower Togue Ponds. The Katahdin Lake Wilderness Camps (katachdinlakewildernesscamps.com) are on the southern end of Katahdin Lake and have been operating since 1885. Though privately owned, the camps are contracted out to Baxter State Park. Reachable by a three-mile hike, cross-country skis, snowshoes or, in summer, by float plane, these are individual cabins, some with lakeside views. A main lodge offers a dining room, kitchen and library. Cabin only rates, as well as meal plans are offered. As an example, a housekeeping cabin averages $35 per person per night, while the additional meal plan averages $125 per person per night. Canoes and kayaks are available for rent. Guided trips to Chimney Pond are offered. Guests enter Baxter State Park at the Toque Gate and park in the Katahdin Lake Parking lot, and then follow the marked trail to the camps. Located just south of Baxter State Park and a 28 mile drive northwest of Millinocket via Millinocket and Golden Roads, this 46,271 acre preserve is overseen by The Nature Conservancy. Within its boundaries are old growth forests and countless numbers of remote ponds. The name means “carrying place” because the Native Americans often carried their canoes from one waterway to the next, often around waterfalls and whitewater rapids. Aside from some previously established camping spots, this area is nearly untouched. Rainbow Lake, almost in the center of the preserve, covers 1,664 acres and reaches a depth of 130 feet. Water mostly comes from the spring runoff and is cold and clear. Rainbow Lake has a healthy population of brook trout. Since the lake is so clear and the fish can see you as well as you can see them, your best time to fish is in the evening. Taking a boat to the deeper part of the lake also works well. Doughnut Pond, a tributary is a spawning ground for the fish. Other small ponds in the area include Clifford, Big Beaver, Little Beaver, Woodman, Bear and Collins. Some are connected by small streams, to others you must portage, or carry, your canoe or kayak to reach them. Access to Rainbow Lake is by air or by the Appalachian Trail that skirts the south-western edge. Companies such as Katahdin Air offer fly-in service as well as fishing trips, with or without canoe rentals. Round trip flights average $140 per person, one-way half that. Canoe rentals are currently $30 per day. Primitive campsites around the lake are available. On the eastern end of the preserve are First, Second, Third and Fourth Debsoneag Lakes, Debsoneag Deadwater and Hale Pond. Just outside the boundaries are Passamegamet Lake and Pemadumcook Lake. Most of these are reached via feeder roads from Golden Rod, Millinocket Road and Baxter Park Road. Nahmakanta Lake is the centerpiece of the Nahmakanta Public Reserved Land, managed by the State Park Service. It is home to the Nahmakanta Wilderness Camp (Nahmakanta.com), in business since the 1870s. A section of the Appalachian Trail runs within a half-mile of the camp, just one of the hiking opportunities available. Canoes and kayaks are available to explore the most remote shores of the lake, some with white sand beaches and others rocky with fringes of forest. Moose, deer, loons, eagles and brook trout are all plentiful. In winter dog-sledding tours are offered. Nahmaknata Wilderness Camp is about 46 miles from Greenville, via Route 15 to Kokadjo, with the remainder on well marked, well maintained gravel roads. The other option is by float plane from Ambajejus Lake, eight miles west of Millinocket, offered from mid-May to mid-October, weather permitting. The camp offers rustic but comfortable cabins, with or without meal plans. Sample rates include a cabin with meals at $140 per person per night or a cabin with kitchen at $80 per person per night. Registered Maine Guides offer moose tours, fishing trips and combination trips. Chesuncook Lake is west of Baxter State Park and is actually a reservoir that was created when the West Penobscot River was dammed in 1903. At 22 miles long and up to four miles wide, this is the third largest lake in Maine. Tiny Chesuncook Village is on the northern edge of the lake, once a logging outfit circa 1849. The Chesuncook Lake House (chesuncooklakehouse.com), founded in 1864 is on the National Register of Historic Places. It once served as a supply base for the logging camps, but now offers cabins for rent in summer and winter, both with and without meal plans. Canoes, kayaks and some types of camping gear are also offered. The Lake House makes a perfect base for an overnight paddling trip to Lobster Lake, the Roll Dam remote campsites and the West Branch of the Penobscot River. To reach the Lake House you must fly in, paddle or motor up the lake or use a 4X4 vehicle (except winter) via the North Maine Woods gate system, jointly managed by private and governmental agencies. This system also reaches Caribou Lake, Baker Lake, Ragged Lake, Fish Lake, Portage Lake, Canada Falls and Caucomgomoc Lake. Penobscot Lake is another remote fisherman’s paradise in the remote North Maine Woods. The Penobscot Lake Lodge (penobscotlakelodge.com), and the lake, are about 60 miles north-west of Greenville, via Route 15 and then a 41-mile long, well marked dirt road. The other option is to fly in on a float-plane. Basic room rates at the lodge average $199 per person per day with all meals and use of canoes and kayaks. Fishing packages, romantic weekends and retreat specials are offered. Penobscot Lake and the lodge are known for fishing, hunting, shooting sports, kayaking and bird-watching. The lake itself is about two miles wide and four miles long and is well stocked with brook trout and rarer blueback trout. Fly-fishing works best, but lures also work. The lodge is only a mile from the Canadian border, which is marked. “Walk” to Canada and then take a picture to prove it. Chemquasabamticook Lake, west of the Allagash Wilderness Waterway is another remote hideaway. This is home to the Ross Lake Camps, a Maine hunting camp offering rustic cabins with or without a meal plan and with free use of the camp canoes. Registered Maine Guides lead moose, bear and deer hunting trips in season. Fly-fisherman come to the lake to angle for trophy sized trout. Cabins average $34 per person per night without meals, and $85 per person per night with all meals. Hunting trips vary in price depending on length. The lake is sometimes referred to as Ross Lake. Also southwest of the waterway are Shallow Lake and Loon Lake. Both are known for their healthy populations of brown trout and lake trout. Shallow Lake is also known by its American Indian name Moskwaswagamok. Loon Lake, though remote, is home to a number of vacation rentals, either rented by their owners or through agencies. Umbazooksus Lake, a man-made lake used for hydroelectric power, is south of Shallow Road, off Winter Road. Ripogenus Lake is just west of the Desconeag Lakes Wilderness Area. It is a man-made reservoir 33 miles northwest of Millinocket via Golden Road and Chesuncook Lake road. The closest camp is three miles away, across the Ripogenus Dam. Frost Pond Camps (frostpondcamps.com) offers cabins and campsites along the shore of Frost Pond. Kayaks and canoes are available for rent and guided hunting and fishing trips are offered. Maine Woodsmen classes are available onsite, including Map and Compass Reading, Tree Identification, Animal Identification and Woodsmen’s Skills. Hands-on field trips are part of the instruction. Seboomook Lake is north of Moosehead Lake. It was created in 1893 when the Penobscot River was dammed to allow logs to be transported downstream. 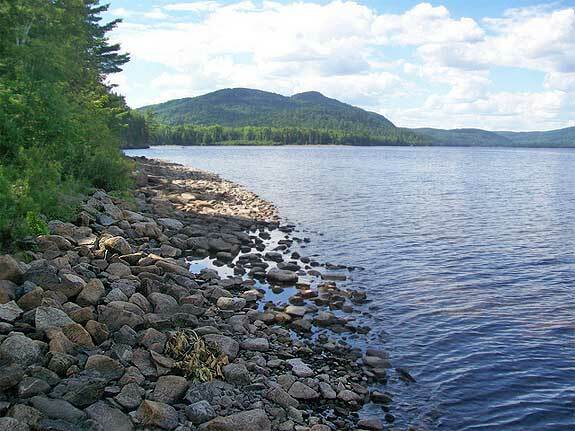 The lake is the site of an archaeological study by the Abbe Museum in Bar Harbor. It has proven rich in artifacts from the early Native American cultures that used the Penobscot River for transportation. Tiny Seboomook village has roughly 50 full time residents, with that number going up during the summer tourist season. The Historic Pittston Farm (pittstonfarm.com) on the western end of Seboomook Lake was a prolific farm, helping to supply food to the Great Northern Paper Company. Now it offers rooms in a lodge section, cabins and a carriage house, big enough for a large family. Accommodations are offered with or without meals. Open year round, the farm offers fishing, hunting, leaf peeping, horseback riding, hiking and ATV trails. In winter the snowshoes, skis and snowmobiles get quite the workout. Seboomook Lake is 74 miles north of Greenville via Route 15 and Golden Road. Grand Lake Seboeis is northeast of the Baxter State Park, roughly 90 miles from Millinocket via Route 11 and Snowshoe Road. It is part of a paddling adventure from Oxbow Junction via the Seboeis River. Much of it is whitewater, but on occasion during late summer and into fall the water dries up and you end up hitching a ride or carrying your canoe to the lake. But take heart, this is the time of year when the trees are bathed in red and gold and the scenery gets top marks. Visit the following directories to find lodging, dining, attractions, shops, services and recreational activities in Maine’s Northwoods area.